Lucien Beaumont, a guide at the Londolozi Game Reserve in South Africa, was observing a pride of lions on the move, when they surrounded something. "My imagination started to race, trying to figure out what they had found," he writes on his blog. He never imagined it would be a porcupine—or what would happen next. All was not lost however and the porcupine began to shake its tail (known as a rattle)— the sound of the quills makes a distracting noise. 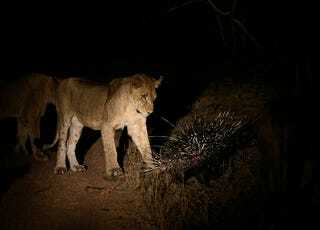 The porcupine began to run backwards into any lion that would come too close for comfort, a common defense mechanism for a threatened porcupine. If the porcupine manages to get close enough to a predator, it does not shoot its quills as many people may think. Rather the quills have micro-barbs, which hook into the face or paws of a predator that may get too close. The quills simply pull out of the porcupines skin without causing damage to the prickly creature. The predator then has to deal with a painful quill. The downside of this is that there is a chance of the quill breaking off in the skin and this can cause a major infection. The porcupine simply re-grows any lost quills—the quills are a type of fused hair. The lions lost interest and left, leaving the porcupine to live and fight another day.